I report now from a much nicer Baymont Inn near the heart of Albuquerque, New Mexico. It has a roof and everything! It is also right next to I-40, which brings to mind that old Blues Brothers quote about the train going by so often you won’t even notice it. Day Two of the road trip saw us trekking across three states, and we actually started to feel like we were in a different part of this obscenely large nation. Of course, we still had to find a way out of Oklahoma first. We found ourselves marveling at the windfarms and the red dirt, which tells you a little about how exciting this part of the drive was. But we did stop in Elk City, home to the National Route 66 Museum. Artifacts, pictures, maps, and cars from Route 66’s heyday were all housed in this moderately-sized reliquary, and the staff was friendly, helpful, and informative. The mannequins — of which there were many — were none of these things, and may even have stolen little pieces of our souls. 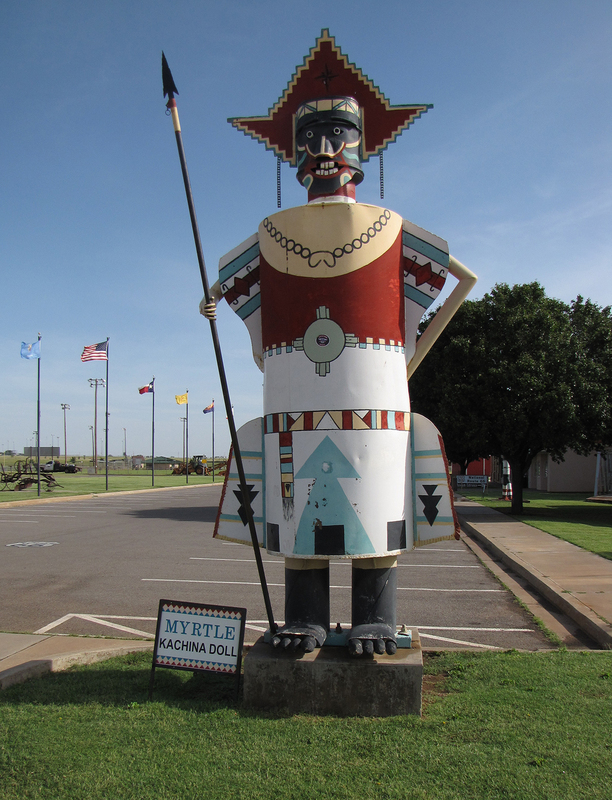 It wasn’t long after we departed Elk City that we found ourselves neck-deep in Texas. The Texas Panhandle is probably the flattest place I’ve ever seen. You could stare off for miles in any direction and not catch glimpse of a single distinguishing feature. And where Oklahoma liked to remind us not to drive through smoke, Texas seemed obsessed with the notion that THE LEFT LANE IS FOR PASSING ONLY. 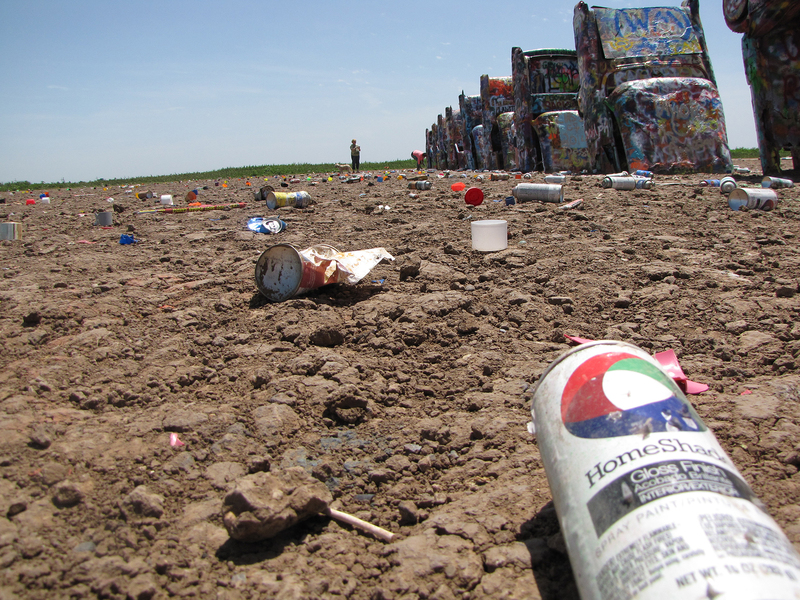 We blew right through Amarillo with a knowing wink, and stopped at the Cadillac Ranch, which is the most inexplicably popular tourist destination I’ve witnessed. Imagine several old Cadillacs shoved nose-first into the ground, left to bake in the Texas sun for years, and subject to the whims of anyone with a can of spray paint. This is literally all the Cadillac Ranch is, and yet we found ourselves there, and found people who had traveled from Oregon, from Virginia, from Illinois, even from Canada. Can the pull of sanctioned vandalism be this strong? But our time in ABQ was short, so after a delicious blondie sundae at the Flying Star Cafe, we retired to our motel to plan the next leg of our voyage. And since that takes us to the Grand Canyon and surrounding campgrounds, my next update may be a couple days in coming. Hell, this update may be a couple days in coming the way the wi-fi works at this place. I take back all the reservedly nice things I said about it. 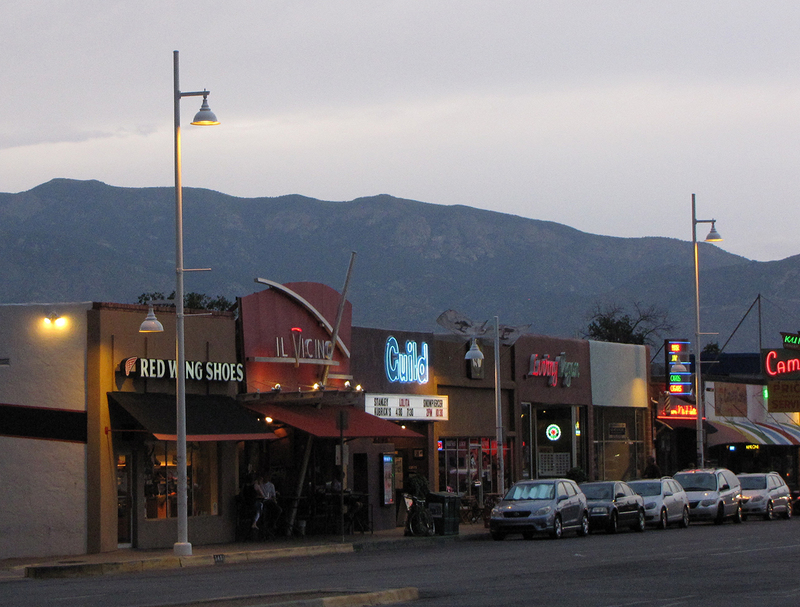 Tags: Albuquerque, New Mexico, Oklahoma, photography, Route 66, Texas, travel. Bookmark the permalink. Previous post ← OK, I Guess? Love the report your giving about the trip keep it up.